Erected by William and Hugh McGregor of Victoria Australia In loving memory of their father. 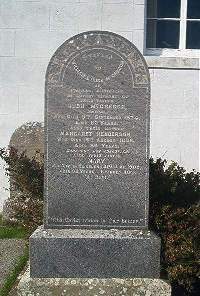 Hugh McGregor of Smerral died 9th September 1874 aged 82. Wife Margaret Henderson died 19th August 1896 aged 86. Daughter Mary McGregor died at Edinburgh 30th June 1908 aged 66 interred here.